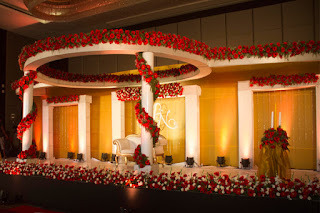 This stage was designed by us for a luxury betrothal in Iritty, Kannur. The requirement of the client was simple.The invitees had crossed 6000, he must have a crowd control entering the stage. the ramp easily provided the solution. the ramp was 3 feet wide and the guests could walk the ramp, only one at a time, in a queue. The theme was gold and white. Gold symbolizing luxury and white...simplicity and purity.